It's going to need a catchier name, but “multiblock copolymer polyurethane” is almost certainly the biggest development in bullet resistant glass since Edouard Benedictus accidentally invented laminated glass in 1903. A piece of multiblock copolymer polyurethane can easily absorb tremendous force, offers better ballistic performance than steel at one-seventh the weight, and swallows up bullets while staying clear as a mountain stream: No spalling, no cracking, and no haze of micro-fissures frosting the glass. Researchers from Rice University and MIT’s Institute for Soldier Nanotechnologies have written the academic papers on “multiblock copolymer polyurethane,” but the material itself–like most advances in bullet proof technology–was almost an accident. During the wars in Iraq and Afghanistan, soldiers happened to notice that some of their vehicles consistently weathered IED blasts better than others. They discovered that these vehicles had something in common: All had been treated with a polyurethane-based undercarriage spray meant to prevent rust. When researchers began tinkering with polyurethane, they discovered that they could cast panes of it that looked like a standard monolithic thermoplastic (like the acrylic used for lower-level conventional bullet proof glass systems). But, on a microscopic level, these polyurethane-based barriers were actually composed of hundreds of parallel layers, each around 20 nanometers thick. These layers had different physical characteristics: Half were hard (like tempered glass), and the other half were flexible to the point of being almost rubbery (like polycarbonate). These two sorts of materials occurred in alternating layers. In other words, this multiblock copolymer polyurethane was similar to glass-clad polycarbonate–and other high-level bullet resistant transparencies–but on a microscopic level. This microscopic layering means that the material performs very differently than its old-school cousins. 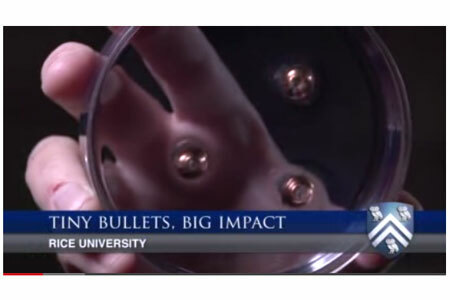 When a projectile strikes a shield made of this new multiblock copolymer polyurethane bullet resistant glass, the rubbery component of the barrier momentarily becomes a viscous fluid, absorbing the bullet’s energy and swallowing it up before resealing. The result: No ricochets, no chips of material flying off the ballistic barrier, and highly localized damage to the bullet proof glass.